BERLIN - The Berlin girls basketball team wanted to make sure its seniors left their home court for what could be the final time this season on a high note. 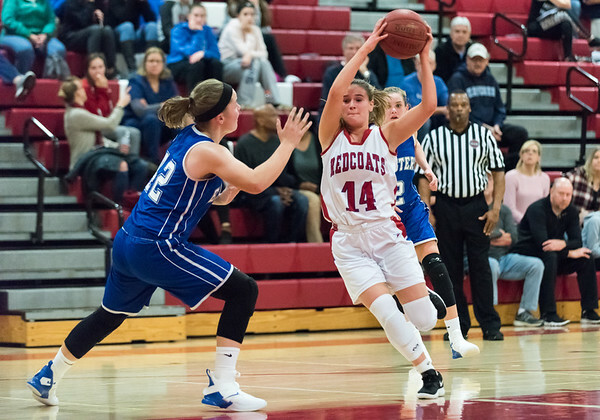 Ashley Wenzel finished with a game-high 14 points and Lyzi Litwinko added nine more as the Redcoats cruised to an east 48-22 win over Maloney Thursday night. Berlin’s three seniors: Angela Perrelli, Zenaw Lewis and Ani LaPointe contributed six, two and four points respectively. Newington 48, Rocky Hill 26: Ashanti Frazier finished with a team-high 13 points, seven steals and six assists, while Olivia St. Remy pulled down 11 boards as the Indians picked up their 17th win of the season. Newington controlled the game from the beginning, leading 16-2 after the first quarter and 31-12 at the half. Posted in New Britain Herald, Berlin, Newington on Thursday, 7 February 2019 22:29. Updated: Thursday, 7 February 2019 22:31.